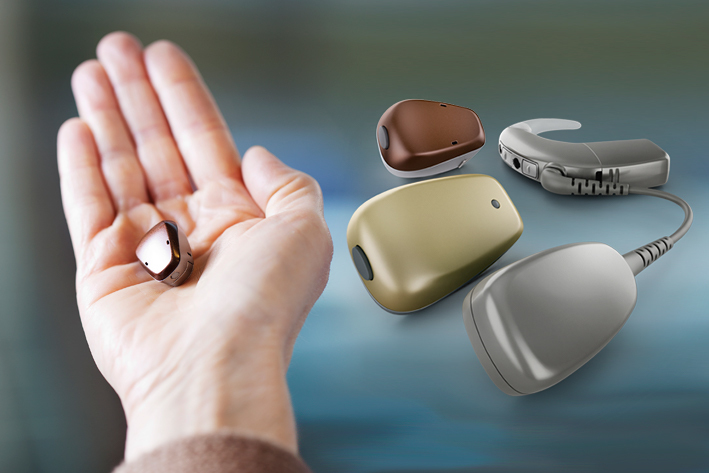 Baha stands for Bone Anchored Hearing Aid, and refers to a surgically implanted hearing device that depends on direct bone conduction to transmit sound. FDA-approved and in use since 1977, Baha relies on the skull bones to transmit sound waves to the inner ear, stimulating the nerve fibers and enabling hearing. The Baha is comprised of three parts: a titanium implant, an external abutment, and a sound processor. The implant is surgically inserted into the skull bone immediately behind the ear, where it eventually fuses into place (a process known as osseointegration). The external abutment is attached to the implant, and the sound processor is connected to the abutment. The sound processor converts sound into vibrations, which are transferred to the implant. The implant then uses the skull bones as natural conducting pathways to transfer those vibrations to the inner ear, where they are perceived as sound. The BAHA mimics the natural hearing function of the inner ear. The two components of a cochlear implant, including the external sound processor and the internal implant, work together to bypass the part of the ear that is no longer working, to deliver sound directly to your hearing nerve. It is available in a range of colors that are meant to match various hair shades, enabling it to blend in unobtrusively. Many people will be completely unaware of the fact that you are wearing an implantable hearing devise. The Baha isn’t simply cosmetically appealing. The result is clear and crisp sound wherever you are. Your doctor or audiologist is best qualified to assess whether a Baha implant is the right choice for you. The ideal candidate suffers from a conductive (outer or middle ear) or mixed (combination of middle and inner ear) hearing loss, or single-sided sensorineural deafness. Other patients considered strong candidates are those with chronic ear infections, congenital ear defects, sudden hearing loss, acoustic neuroma and Meniere’s disease.